Often the first place a visitor sees is your car park and you don’t get a second chance to make a first impression! So make sure you create a great first impression with a car park decking system installed by Flowstone. As an independent contractor, approved by the leading resin manufacturers, we are able to select from a wide range of products, offering our clients the most appropriate solutions. Not only do the coatings we install make your car parking facility safer and enhance it visually, but more importantly, they protect and waterproof the concrete and metal structures helping to maximise the car park’s life span. Health and safety legislation relating to the operation and maintenance of multi-story car parks has significantly changed in recent times. Flowstone works with main contractors and owners to ensure their facilities are safe and secure and comply with the requirements of the Health & Safety Executive. Problems with car park structures are often the result of poor design or inadequate maintenance. The aggressive atmospheric conditions in towns and cities and exposure to weather will accelerate the corrosion of steel reinforcements and water ingress along with oil and chemical attack from vehicles damages the concrete fabric. The top deck is most exposed to damage and this can result in leaks to the lower decks and so requires the most effective waterproofing. Carrying out effective, protective maintenance of your car park can extend its life in excess of 15 years turning your maintenance costs into a long term investment. Need your car park back in a hurry? Flowstone can offer high speed repairs and coatings with the latest fast drying resins enabling car parks to reopen within a few hours of completion. Flowstone offers a portfolio of solutions can also enhance the visual appearance and improve the efficient usage of car park flooring by introducing colours that are more attractive than black asphalt and grey concrete. Colours can introduce demarcation zones for pedestrians, parking and no-parking, visitors, disabled bay, deliveries, private parking, refuse collection and other activities. 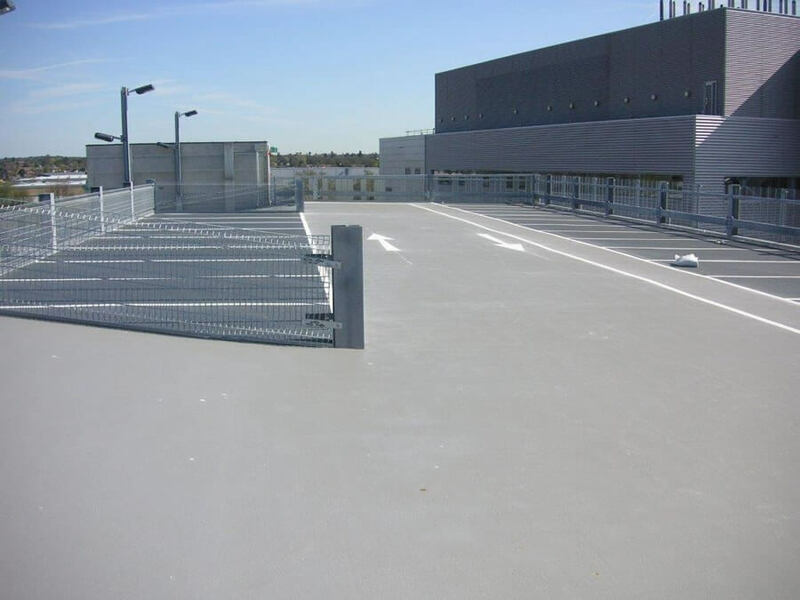 Coatings are available in a wide range of colours and are also available with inbuilt light reflectivity properties which can help to reduce the need for artificial light in underground or internal deck parking facilities.